It’s only a matter of time before you have your dream kitchen, but first you must endure the kitchen remodel process. People often ask: what is the hardest part of any kitchen remodel? The answer for most people is living without a fully functioning kitchen while the process is completed. You’ve likely heard the horror stories, such as your neighbor’s remodel that went on and on. Thankfully there are a number of things you can do to help your kitchen remodel go more smoothly. Here are 13 survival tips to get through the kitchen remodeling process. Before renovations ever begin, set up a station outside of the kitchen that can serve as a makeshift space to prep and store food while your real kitchen undergoes its face-lift. In your mini prep kitchen you can relocate your full-size fridge, or set up a mini-fridge. You may also want a small table of some sort to serve as a preparing station for food. A simple makeshift kitchen can make life a lot easier, plus it ensures you don’t have to eat out for every single meal. A guesthouse, spare room, or even an unused corner in the laundry room can make a decent space for your temporary mini kitchen. There are a number of places you can set one up, it might seem strange now but you’ll be so glad you have it once your real fridge is off limits and unplugged. The best way to improve your kitchen remodel experience is to make the process go by faster. Kitchen remodels can drag on and on, causing people to go without a fully functional kitchen for months upon months. This usually happens because renovations begin before all materials are decided upon, ordered, and delivered. 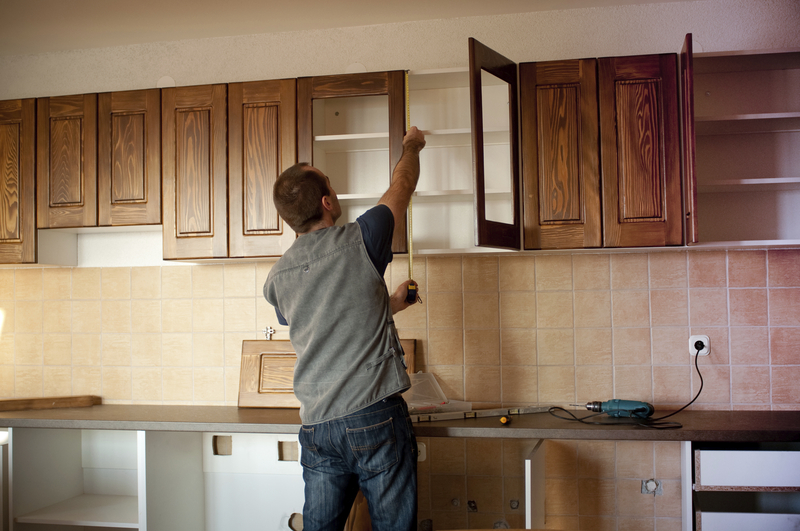 If the kitchen cabinets you love turn out to be unaffordable, or the floors are backordered, there’s no telling when renovations will pick back up again. 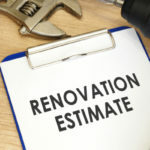 By having all of your final selections picked out and ready before you start knocking down cabinets and uninstalling appliances, you prevent the possibility of a big time delay in renovations. 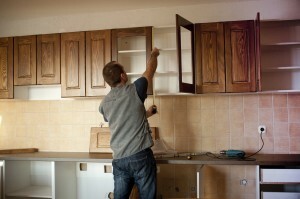 Important to note, cabinets must be installed before measurements for countertops are taken to ensure a proper fit. 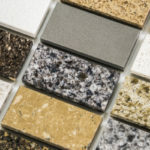 So while you might not have all of the materials on site prior to starting, you should have almost everything other than the countertops. Once cabinets have been picked out and ordered they can take anywhere from 8-10+ weeks to arrive. Countertops take less time to order; sometimes the slab can arrive in as little as 10 days. No kitchen remodel is going to be complete within a day or two, but by planning ahead you can shave months off of the process. Eating out is fun, but it quickly gets old. Before long you and your family will be craving a home cooked meal. You don’t need a full kitchen to provide a good meal, a slow cooker, electric griddle, microwave, panini maker, camping cook stove and toaster oven can all become your new best friends. There are so many different meals you can make using these small cooking appliances. Plus they are small enough to fit just about anywhere. Wondering where to eat? You can always throw a fun indoor picnic by spreading a blanket down on the ground to all gather around. Hey, at least indoor picnics don’t include any bugs! By nature of having your kitchen torn down and rebuilt, you won’t have the same access to foods you are used to. Be prepared for eating out and eating fast meals at home to become a part of your life. There are many meals you can make ahead of time that can be stored in the freezer and made in the oven or microwave while the kitchen is not accessible. Great meals to make and freeze include chicken potpies, an egg and vegetable quiche, homemade pizzas, or meatballs. This provides a fast way to make more substantial meals while your kitchen remodel takes place. 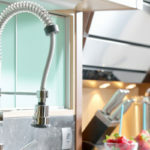 If you do plan to eat at home during your kitchen remodel, how do you plan to wash your dishes without access to a dishwasher? The bathtub, swimming pool, laundry sink… all of these options sound a bit messy. Even if you never use paper and plastic utensils, now might be the time to start. Biodegradable utensils are available for purchase and will make your life so much easier while renovations are underway. You can further organize your long-term storage by placing items in well-labeled boxes. This makes it much easier to find something you may need before the remodel is complete, and ensures you don’t have to dig through every last box looking for something because there are no labels. Any kitchen remodel includes a good deal of dust and debris. In order to protect the rest of your home, be sure that all surfaces are covered. The path that contractors will be using to walk in and out will become very dusty, and so you should set down tarp to prevent this dust from ruining your floors. Any furniture near the kitchen should also be properly covered and protected. Most kitchen remodeling contractors will cover surfaces before starting to work, but it’s best to make sure that this happens. Not only should your renovation materials be picked out, delivered, and ready to go before beginning a remodel, but you should also make sure everything looks good together. If the floors are installed along with the first row of cabinets before you realize the combination is horrible, it’s going to take a long time to complete your remodel because you will be starting back near square one. If you start handing out invitations for a party celebrating your remodel on the expected completion date, you might want to prep yourself (and your guests) for a disappointment. Kitchen remodels take time and delays are always possible. A party to celebrate your beautiful new kitchen will happen, but you should wait until you know for sure your kitchen is complete before ringing up your closest pals for a party. Kitchen remodels almost always take longer than expected, the key is to be flexible and it’s harder to be limber when you make plans that involve a lot of people. Instead of crowding landfills with old appliances there are many ways to repurpose your old fridge and microwave. Let your contractors know ahead of time that you want to save the appliances from your original kitchen before they are removed from your home. There are a number of local charities that accept old appliance donations to help with a good cause. Why not do some good while enjoying the good fortune of a brand new kitchen? Perhaps instead of donating old appliances you can create a spare kitchen in the basement or garage using your old appliances. Are you the type that easily becomes antsy? Try creating a kitchen remodel progress chart, complete with pictures, checklists, and progress reports. For some people documenting progress on this sort of chart helps make the process less frustrating. When you see the same dusty, tarp-covered kitchen day after day it can start to feel like nothing is getting down. But, if you take photos of progress as it occurs, and create your own project checklist it’s much easier to see progress as it is being made. Remodeling a kitchen is a great way to increase your home value, and for good reason. A new kitchen can totally change the look and feel of a house, plus it makes life easier when you have an efficient space to make meals and entertain. Homeowners often love the results of their kitchen remodel so much they start to realize how much they don’t love the rest of their home. In order to make the bathrooms and bedrooms look just as good as the new kitchen it’s only a matter of time before more remodeling projects are taken on. In other words, as much as you may hate the remodeling process the results are so worth it chances are you’ll be doing it again in a different part of your house within no time. Nothing worth having is ever easy to obtain. You save money in order to afford a kitchen remodel, and then you go through the pain of not having a kitchen while the remodel is completed. You do it all because in the end you are rewarded with exactly what you have always dreamed about: the perfect kitchen. As they say, the kitchen is the heart of any home, and a house without a kitchen can get a little tense. 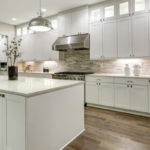 Still, it’s important to remember that even though there might be some headaches along the way, a kitchen remodel lends itself to a more beautiful, functional home you are sure to love for many years. In the end, it’s all worth the hassle so sit back and enjoy the process. Tops Kitchen Cabinet provides the latest in kitchen cabinets, countertops, accessories and more. Contact us today to learn how you can save money on your kitchen renovations by purchasing wholesale!